Check there over the coming weeks for details of where to find the other installments. In the beginning, there was…procrastination. I’d just made my first sale to Carina Press—a steampunk mystery novella—and I was feeling pretty damn cocky. Okay, invincible. I could face down a matrix chock full of Agent Smiths and look cool doing it. Without a concrete project in the works, I had my choice of dozens of dream novels to start. Those long-delayed masterpieces every author cycles through from time to time like rosary beads greased between itchy fingers. The books you’re dying to write but are also s#!%-scared of messing up. One can liken writing a novel to the expansion and collapse of a small universe. That might sound grandiose—it’s only one book, dude—but it’s apt for science fiction, a genre that espouses the idea of relativity (your doorstop is my life’s work) and it’s also an accurate metaphor for the life of a book’s concept. By the time the project’s over, you’ve grown it from a single-line concept to a ninety-thousand-word epic, then shrunk it back to a single-line marketing blurb. In my case, the spark was a movie. 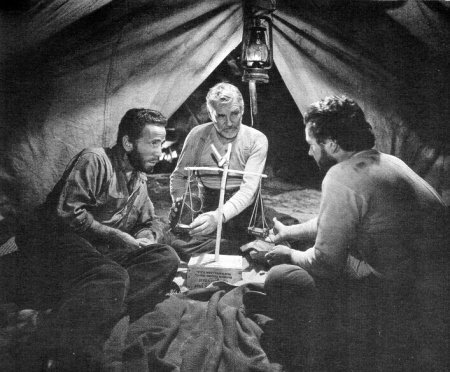 John Huston’s The Treasure of the Sierra Madre, starring Humphrey Bogart, Walter Huston and Tim Holt, is one of the great Hollywood films of the Golden Age. It’s about three homeless guys who go prospecting for gold in the Sierra Madre mountains. They’re on a shoestring budget, miles from civilization; and bit by bit, despite their vow to not let greed get the best of them, it eats away at their fellowship. The older man has seen it all before and knows the signs, but even he can’t stop the soul-destroying rot in the camp. One man in particular (Bogart’s Fred C. Dobbs) succumbs to paranoia and murderous designs. He’s no longer a part of the group, or even humanity—he’s in his own private hell, a gilded cage from where he sees only enemies and competition for his fortune. It’s a chilling story, brilliantly told. And though I’d seen it countless times before, it suddenly struck me how great this scenario could be in a deep space setting. Somewhere even more isolated, hostile, unforgiving. Beyond the outposts of man’s farthest exploration. At the start of the movie, the characters are holed up in a two-bit dive in a Mexican border town. Inventing a science fiction equivalent—the asteroid colony Kappa Max—was probably the most crucial part of the novel I eventually wrote. And I wanted a female protagonist in my story, a drifter heroine not born to that down-and-dirty way of life, who must change in fundamental ways over the course of the story. More on her and the other four characters in Part 2, but I think the concept for Sparks in Cosmic Dust was really born out of my damaged heroine trying to find her place in the universe, and having to survive an expedition she’s in no way equipped to handle. The idea of a used-future is also a bedrock concept in the novel. Our prospectors have to beg, borrow and steal to fund this expedition, and their budget is so limited, their supplies aren’t much better than the rations and tools available in the Old West. In many ways, Sparks is a frontier western set in deep space, with aliens, spaceships, treasure, and lots and lots of baked beans. With this first installment, I’m giving away an ebook copy of my SF novella The Mythmakers (Samhain, 2010). To enter, simply send an email to sevenmercury7@aol.com with SPARKS GIVEAWAY ONE in the subject line. Don’t forget to give your name. I love a good “character finds their way in a strange environment” story and this does sound like a good one : ) Can’t wait to read the story and more of your posts! I love blogs where the author describes the inspiration behind the story. I can’t wait to read this! I love that your inspiration was one of my favourite movies (not a big movie person), especially as Science Fiction is one of my favourite genres in reading, so I look forward to reading your version of it. Here are the five winners in my ‘Writing a SF Novel’ contests. A huge thank you to everyone who entered. 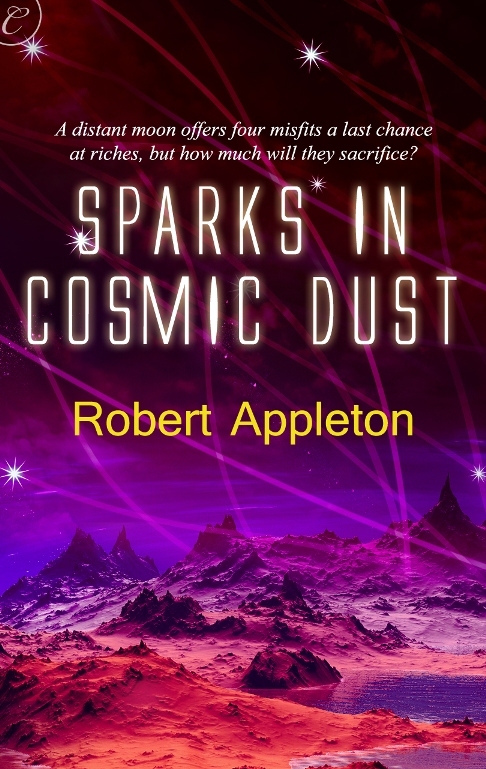 I hope you enjoyed reading about Sparks in Cosmic Dust. I’ve already contacted the first three. Jessa and Natalie, please email me at sevenmercury7@aol.com and I’ll send you your prizes right away. ← Would an alien be a person?